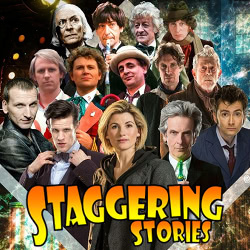 « Staggering Stories Podcast #298: Maximum Power! 02:10 — Doctor Who: Broadcast time confirmed. 03:37 — In defence of the young and the new. 05:28 — Star Trek Colon Discovery: Minisodes incoming. 06:59 — Doctor Who: That Missy sound. 09:26 — Chilling Adventures of Sabrina. 11:51 — Star Trek: CBS kills fan project. 14:28 — Deadpool 2: The kiddie cut? 16:20 – Doctor Who: Each Doctor’s first story. 40:16 – Emails and listener feedback. 47:00 – Farewell for this podcast! 48:12 — End theme, disclaimer, copyright, etc. Big Finish: The Missy Adventures. Wikipedia: Chilling Adventures of Sabrina. This entry was posted on Sunday, October 7th, 2018 at 09:00 and is filed under Doctor Who, podcast, review, Sci-Fi, staggering stories, Staggering Stories Podcast, Staggering Stories Regular Podcast, tv. You can follow any responses to this entry through the RSS 2.0 feed. You can leave a response, or trackback from your own site.